Black unruly fur, mint green eyes, medium height, scar on her chest, long, lean, and very agile, smooth, and precise in the way she moves. Default expression is often a vaguely suspicious-looking smirk. 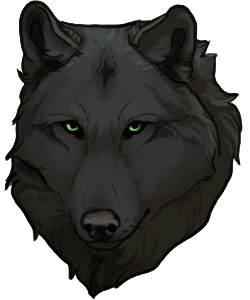 With rangy, roguish appearances, she draws her looks primarily from her dam's side in having deep, dense woodsmoke black fur which is especially wild, long and spiky across her neck and shoulders. The more she matures, she is gradually inheriting the slightest highlights of reddish cedar brown in her otherwise dark coat from her sire. They are most visible along her neck and back and in just the right sort of light—with a likelihood of increasing with age. Her eyes are silver tree green with very subtle rings of persian plum around her pupils. She's well-built, sinuous and although she is not a bulky nor overly large creature, she commands her lean, athletic being well. Her most notable marking is a large scar at the bottom of her chest that is only somewhat visible still. Other scars, while she does have them here and there, are mostly hidden by her fur. A few include a horizontal mark on her left cheek, teethmarks on her left flank and shoulder, bear claw marks on left side of her ribs, plus a crosshatching of scar tissue on the back of her neck masked exceptionally well by her pronounced hackles. Born to alphas of powerful reputations and raised in times of war, she learned quickly and went on to prove herself adept in battle even before her first birthday. Amekaze established dominance over her siblings early and became her mother's apprentice in her sage teachings. Eventually, she grew apart from her littermates then became at odds with them. Her world was shaken most significantly when her younger sister was murdered after her brother was lost. She avenged, but remained unsettled. At her mother's suggestion, she left her homeland to find her focus again. For several months she wandered as a lone wolf and eventually found the Teekon Wilds, and consequentially, the seaside where her interests flourished. A few places and packs caught her eye but all let her down for nearly a year until she joined the ranks of Swiftcurrent Creek. It was short-lived, however, for she left to help found the Sunspire mountain pack in the height of summer with Ferdie Von Pelt and Jace Du'Andris. By the beginning of autumn, she ascended to alphaship of the mountain after Ferdie went missing and ran the pack successfully for the span of several seasons. When their numbers waned and the pack became too quiet for far too long, Amekaze decided to relocate. 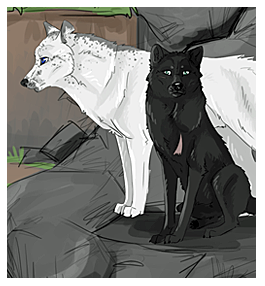 She combined their small numbers with another small pack, Stavanger Bay, at the proposal of their beta, Charon—a wolf she'd found injured in the mountains with a similar situation waiting for him back home. Together as dual alphas, they claimed Moonspear for their new pack. Amekaze fell into a comfortable routine with Charon at her side while the Spear grew then flourished, eventually leading to them promoting Flóki, Charon's younger brother, to beta. Come springtime, the alphas became mates, and the mountain pack further established itself. However summer brought with it strife, first by way of a locust swarm then the famine that it caused. They managed to scrape by on the Spear, not without their own losses and struggle, until the greenery began its slow return. Events then culminated in a mountainside ram hunt that, although successful in felling a meal, injured much of the pack—some of which (Amekaze included) involved a nearby lightning strike. Just afterward, she went into season and was attacked by Lazarus, with his intentions to sire her litter. Charon, who'd already made the same claim, threw him from the mountain and after several weeks of searching for him, later returned his severed head to Amekaze. On the last full moon of the summer, she had her first litter of four daughters. Three of them remained identical all throughout their growth, and together, the four of them grew fierce and loved. Late in the spring of the next year, her second litter was born, bringing her three more daughters and a son. Within the first few weeks, the smallest whelp proved malformed, so was left to the wilds. The parents, litter, and pack, move on without her to bolster their strength upon the mountain—encouraged more by the ascension of Hydra to beta beneath her parents. As such, the pack saw into its second year strong. Another daughter Galaxy mysteriously died before her first birthday later on and war brewed in the neighboring packs well before. Meanwhile, the eldest daughter Korei left when opinions diverged as Moonspear's responses were to viciously protect their own and torment their foes accordingly. With a growing reputation of the sort, the pack split further, but at the core remained the Ostregas--a notion Amekaze propogated further by bearing her third litter in the springtime, only serving to amplify their protectiveness of family above all else. hello hi. I'm almost always available for new threads, reply speeds just may vary. I generally try to prioritize joining threads or anything else deemed ~vaguely important or time sensitive. if my characters seem to have an observing/passive role in a thread or I've mentioned it, skip them in post order if ever necessary, I don't mind. if there's ever a question or discussion needed about anything, feel free to message me on the board or on discord (sylrui#1701).